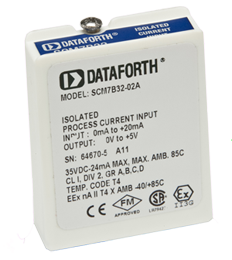 Each Dataforth 7B module provides a single channel of isolated analog input or output. All 7B modules are CSA C/US certified and CE and ATEX compliant. Accessories include a complete selection of backpanels, DIN rail mounting options, interface cables, mounting racks, power supplies, and other accessory items. How do the SCM7B22 and SCM7B41 differ? The main difference is the SCM7B41 is an input module and the SCM7B22 is an output module. The 7B41 module has its input on the isolated field side of the module connect to it through screw terminal blocks. The 7B41 module has its output on the system and power supply side of the module connect to it through DB-25 connector (SCM7BP01, SCM7BP02, SCM7BP04, SCM7BP08, and SCM7BP16). The 7B22 module has its output on the isolated field side of the module connect to it through screw terminal blocks. The 7B22 module has its input on the system and power supply side of the module connect to it through DB-25 connector (SCM7BP01, SCM7BP02, SCM7BP04, SCM7BP08, and SCM7BP16). SCM7B – why are there many bipolar input models, but a lot fewer bipolar output models offered? The SCM7B series is defined for the process industry which has a preference for unipolar signals on the system / power supply side of the module. In fact , there is a preference for a positive offset above a zero current or voltage output, such as, 4-20mA rather than 0-20mA, 1-5V rather than 0-5V, and 2-10V rather than 0-10V. Is the optional plug-in conversion resistor required in order to use the SCM7B32 module? No, the optional plug-in conversion resistor is not shipped with nor is it required in order to use the SCM7B32 module. The current/voltage conversion is achieved by an internal resistor as shown in the block diagram in the data sheet. For SCM7B22 modules when I give LabVIEW (or other DAQ software) an output command, I get no output from the backpanel, why? That’s because the SCM7B22 and the SCM7B39 are output modules, are connected the reverse of input modules, they have their inputs on the system side (power supply side) of the backpanel. They provide their output on the isolated field side of the backpanel. Can SCM7B22 drive +/-10V, 2.5mA input with 0-200Hz sine wave? “I am generating a sine voltage signal with frequency range 0-200Hz, +/-10V using a national instruments module NI 9263 with current drive capability of 1mA. The power amplifier I am driving the sine wave generated with has an input impedance of 4K ohms . (so for a 10V sine wave input to the amplifier, it will send 2.5mA to drive it). It was confirmed that the SCM7B22 would be suitable for his application. I also asked him to keep in mind the 7B22 has a 400Hz bandwidth and the filter is already attenuating slightly at 200Hz. At 200Hz, the output amplitude will be about 91.4% of the input amplitude (about 8.6% attenuated). What is the total power consumption of the 7B backpanel? The total power requirement on the DC power rail is the summation of the power requirement of the individual modules as specified in each module specification. For power budget purposes, multiply the total power requirement you calculated by 1.5 for maximum power needed. Do SCM7BP02 and SCM7BP04 have CJC sensors installed by default? All SCM7B backpanels, including SCM7BP02 and SCM7BP04 have CJC sensors installed by default in every field input terminal in every channel. There is no separate model number for including CJC sensors as in SCM5B and 8B backpanels. Is the SCM7B32-01 a suitable replacement for the Analog Devices 7B32-01-1? Yes, the SCM7B32-01 is a direct replacement for the 7B32-01-1. Any application that uses a 7B32-01-1 will support an SCM7B32-01, and vice versa. Is it possible to utilize remote CJC with the 7B47 modules? SCM7B47 modules are designed to interface the 100k NTC thermistors which are installed on the SCM7B backpanels. Therefore, remote CJC is only possible if the 100k thermistor is replaced with a fixed resistor which requires a custom backpanel.